Meet the people shaping the future of design. Students from design programs stretching coast-to-coast recently traveled to Michigan in the heart of winter to unveil their final design submissions for Steelcase’s annual NEXT Student Design Competition. The finalists emerged from more than 65 programs and 800 students competing this year. The students rose to the challenge of creating the next generation design studio situated in Los Angeles’ entertainment district. All five finalists presented in front of a panel of top industry leaders. Judges awarded Amy Groome, a Virginia Tech talent, top prize for her design inspired by Frank Lloyd Wright. 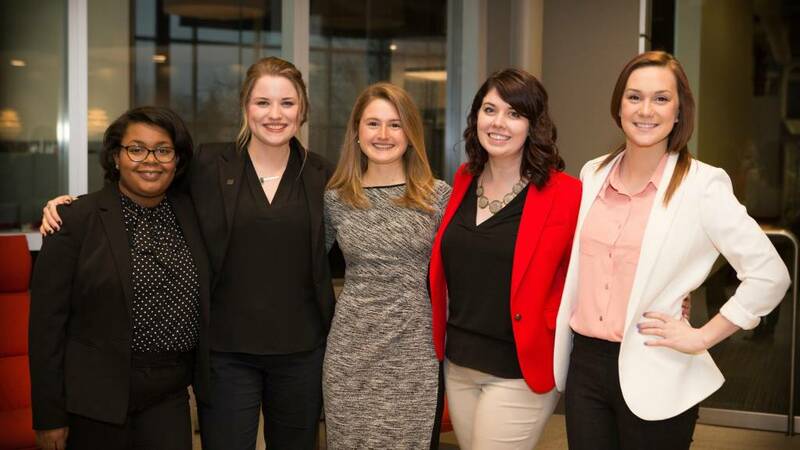 All five women who made the journey to Steelcase said they came away winners — validated for taking risks, energized by their new peers and inspired by their differences. Each finalist’s’ design started with similar parameters and resulted in different concepts, space plans and proposals. Wondering how young designers create a space for future designers like themselves? Take a look. Modular furniture, abstracted geometric patterns and an open plan in Amy’s design nod to Frank Lloyd Wright’s design principles and support a collaborative office culture. 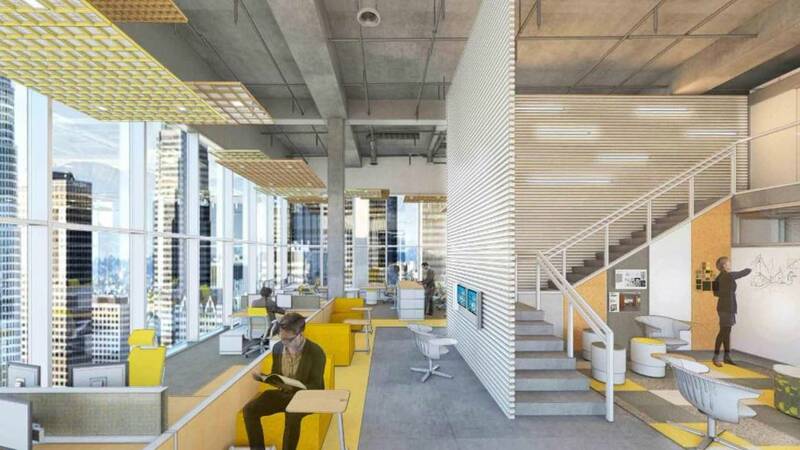 Amy’s design provides an ecosystem of spaces in order to cater to all generations and work styles. 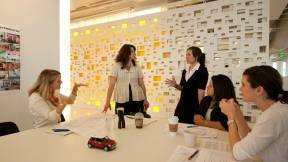 White boards, cork and magnetic slats provide multiple ways for collaboration and presentations in Amy’s design. 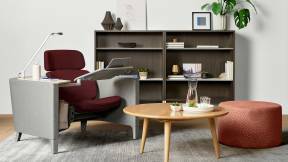 Steelcase 360: Frank Lloyd Wright inspired your design. How did looking to the past help you design for the future? Amy: Since this project was for a architects and designers, I got to put myself in the shoes of the user. It was a unique opportunity. We are taught to look to the icons of our industry for the principals of design. I was in LA looking for inspiration for this design when I saw Frank Lloyd Wright’s Hollyhock House. Even though I wasn’t designing a Frank Lloyd Wright interior, I was looking at how he learned and what his process was and pulling that into the design. One of the really fun aspects I found was that he referenced playing with Froebel Blocks in his early life. My professor had some of the wooden blocks and lent them to me. I was tinkering and playing with them and it made me think of the importance of modular furniture. I wanted to represent that ability to move things around in the design. 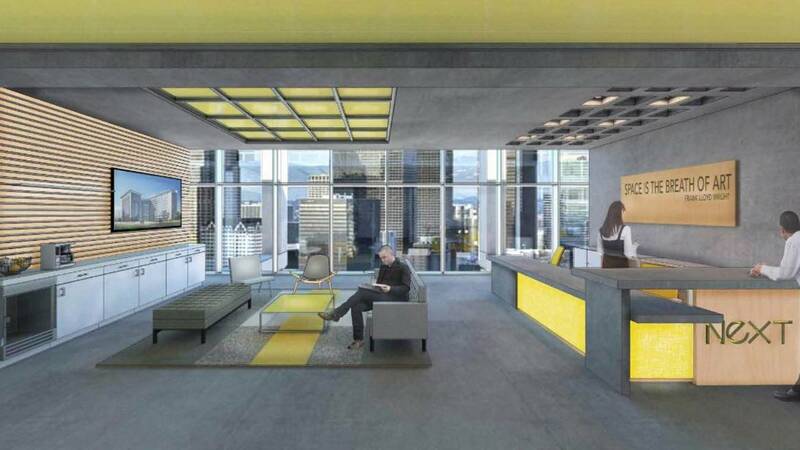 Bailey’s design for the reception area encourages people to find their own way immediately upon entering the studio. This way they can define for themselves what balance they need in the workplace. Bailey’s mezzanine elevates the levels and intersections of work, show and play within her design lifting the eyes and offering respite when needed. Bailey’s cafe and bar area includes a variety of lounges, private relaxation spaces and stadium seating to allow people choice and control over how they work, show and play in the studio. 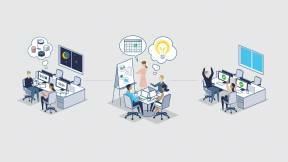 Steelcase 360: What work modes within the design studio is your design intended to support? And, how did you manage to create a sense of connection to the outside environment within the space? Bailey: I defined those modes as work, show and play — basic ways we work as designers and professionals. The key is having a balance between the three and allowing each person to define them individually. For example, “play” is the place to destress, but for different people that means different things. Some people will want to socialize in a cafe, others to tuck away in a Brody WorkLounge to rejuvenate or, yet others, who may want to get up and move by using a Walkstation on the mezzanine. As for connecting the studio to its location, the first thing that jumps out of the design is how much space the mezzanine takes up. I really wanted it to pull in LA’s unique vibe and culture. It’s more than glitz and glamor. It’s the financial district, fashion district and the arts building all around the space as well as the mountains in the distance. Being able to connect the surroundings to the inside adds vibrancy and channels some of that LA energy into the studio. 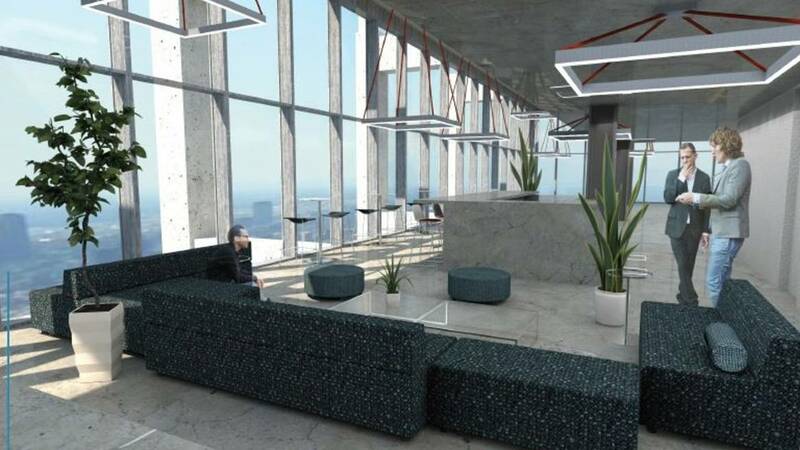 The mezzanine allows people to take it all in with floor to ceiling windows. 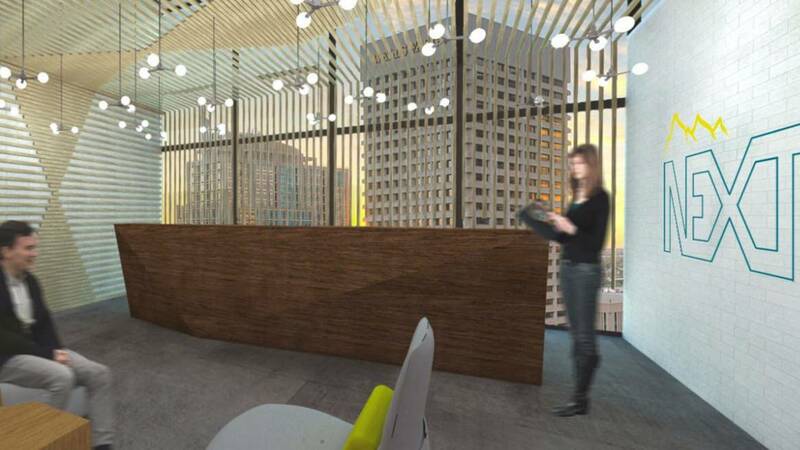 While designer’s may be able to see how the space works together from the ground floor, prospective clients may appreciate getting a broader perspective of the entire space and it’s outside environment from the mezzanine. Kathleen’s design aims to strengthen productivity, efficiency and wellbeing through the encouragement to connect and come together. Natural wood materials throughout Kathleen’s design create a biophilic connection to nature to enhance user wellbeing. Kathleen incorporated private together spaces in open areas of her design to stimulate connections and collaboration. Steelcase 360: Every designer works differently. How did you use your experience and creative process to design your studio? Kathleen: I started with blocking and bubble diagrams. I had to figure out what spaces should be adjacent to each other. I had two or three ideation sketches with completely different floor plans. It was interesting to see how many options I could come up with. It comes down to convenience and where people will feel most comfortable walking and working. You have to put yourself in the space instead of just looking at it from a plan view. I also create word clouds which help me build design goals. In this concept, I used the idea of the surrounding San Gabriel mountains to lead me to the word “summit” and then to the concept of “converge.” My design encourages minds to converge at a peak to generate artistic excellence, from professional creative bonds and work toward effective and dynamic solutions. Lexi’s reception desk is more than meets the eye. 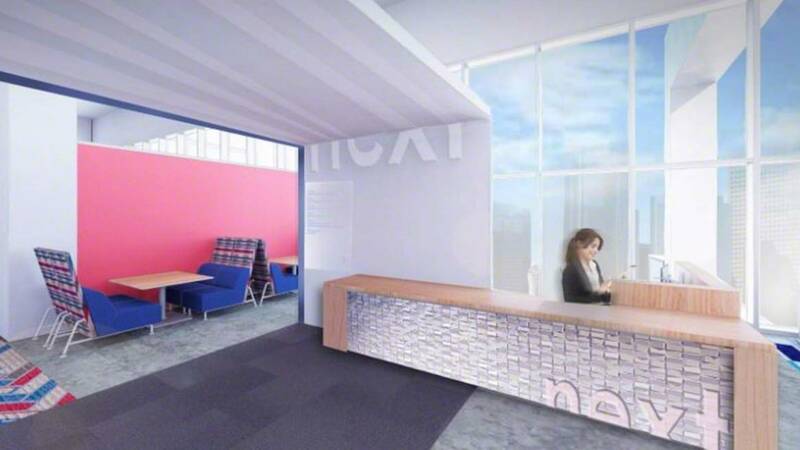 Behind the white half wall, the receptionist has access to an unseen area which includes a height-adjustable desk and other resources to assist visitors. Lexi’s design includes stenciled and whitewashed wall applications in focus rooms to highlight architectural details around Los Angeles. This area in Lexi’s design includes all the digital and analog sharing tools a designer may need when working with a project team. Surfaces can be written on or used to tack up inspirational items. 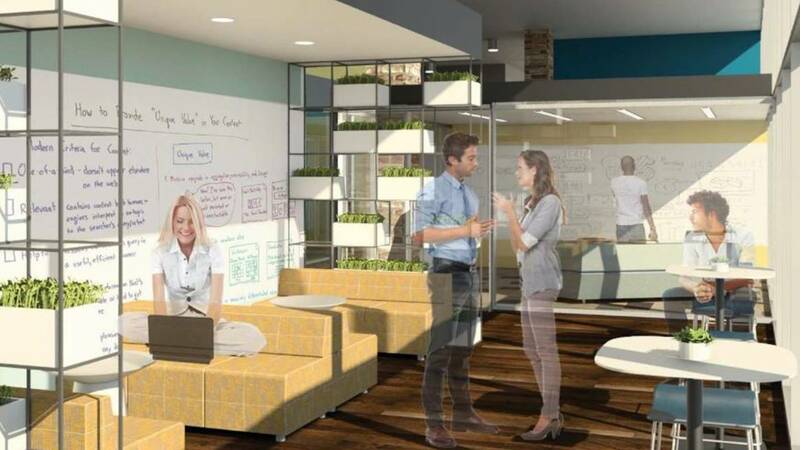 Screen-sharing and virtual reality technology can also be used in the open space along with moveable handheld whiteboards. 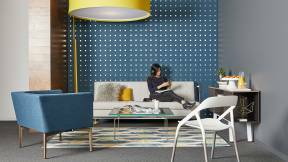 Steelcase 360: You identified specific design personas as users of your space? How did this help inform your design concept? Lexi: I picked four personas; the Focuser, the Learner, the Collaborator and the Socializer. I was thinking about how we are designing a space for designers. Everyone who worked in the space would have their own idea about how it should work. After doing research, I realized just by saying a space is a focus space, doesn’t make it so. It’s important to offer affordances within a space to allow different people to use spaces differently depending how and where they need to work. This led to the “reveal gradient” I presented. It shows us that not only are people different, but the same person is going to need different things throughout the day to do their best work. In the morning, someone might be in one part of the gradient. But, after a few cups of coffee, they might be ready to transition to another part of the gradient and that happens throughout the day. The in-between spaces are where the gradient needs to be filled in to complete the design. 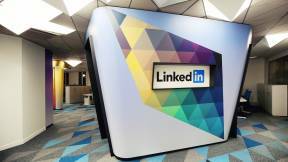 For example, when someone is coming from the workcafe, they’ll pass through a large open space to a series of small breakout spaces for phone calls or focus work. 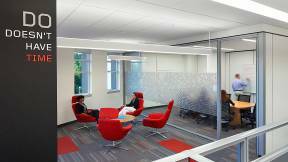 By bringing the scale down, people have the opportunity for visual and acoustic privacy. The corridors also include stools or surfaces to allow people to pop in and out of the circulation area. Martina’s concept is a terrarium, a miniature ecosystem of relationships between organisms and resources. Just like in a workplace, each component within a terrarium is dependent upon each other to grow and thrive. Marina’s design includes places that offer people a variety of ways to achieve privacy in both open and enclosed spaces. Caption: Martina’s terrarium concept influenced the materials she chose for her design. The work cafe is just one area that includes elements from potting soil, stones and flowers. 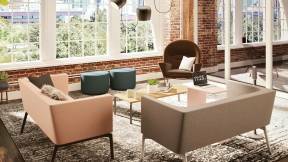 Steelcase 360: How did you go about creating a design studio for designers? Was there anything specific about designers that influenced your concept? Martina: I looked at my own experience as a young designer. We use whiteboards in our studio. We sit down and draw out our thoughts. Our interaction is extremely important. 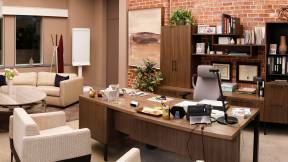 I wanted to create a space where people could come together and collaborate and create a community within the company. One place I was able to do that was in the design of the workcafe. It was important to me that this space was multifunctional for people. I wanted an environment where people could use the space in a variety of ways. I created areas for small meetings, large social areas and focus areas to expand on the idea of giving people choice and control over how and where they get their work done.